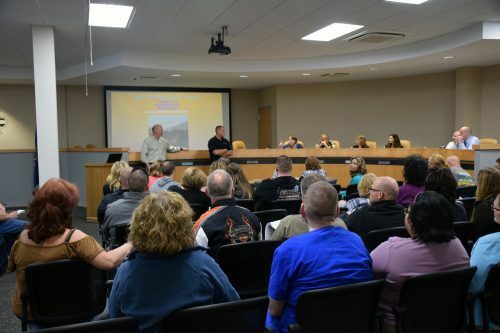 WARSAW — On Tuesday night, members of the Warsaw community gathered at City Hall for a discussion about solutions and resources for the addiction crisis in Kosciusko County. Many were in attendance and remarks were made that there wouldn’t be enough seats for everyone in attendance. The evening started with presentations from representatives of Allen County. Dr. Debra McMahan, Allen County health commissioner, Dr. Gregory Eigner, associate program director of Ft. Wayne Medical Education Program, Kristina Johnson, director of community initiatives for Lutheran Foundation and Michelle Merritt, executive director of Trek Limitless Foundation all presented in front of the audience. Eigner was the first to present and talked about the Opioid crisis that Allen County and the rest of the country is experiencing. He said the United States consumes 80 percent of the Opioid supply worldwide. And also in Indiana, there are an average 109 prescriptions made per every 100 people. Next to present was McMahan. She talked about the different paths people can take that may lead to medication abuse. These paths can include mental illness, chronic pain, young people experiencing sports injuries and treating chronic or acute pain with Opioids. “The medical community really has to step up their game when treating people,” said McMahan. Johnson spoke to the audience next and talked about Look Up, an online resource the Lutheran Foundation created to combat the addiction crisis. The website focuses on providing educational resources for mental and behavioral health. Along with being able to look up available resources by zip code, the organization also has a chat based text component where individual can text “LOOKUP” to 494949 to talk with a real person. “We would be happy to share any of our initiatives and practices with Kosciusko County,” said Johnson. The final presentation of the evening was given by Merritt. She talked about her journey as a parent to an addict and how her family overcame the addiction and found local resources. She stressed a point that was touched on by everyone throughout the night, that mental illness and addiction need to be destigmatized and treated like any other illness. After the presentations, the audience was able to ask questions to a panel of the speakers and representatives from Kosciusko County. Included in the panel were Chief of Police Scott Whitaker, Lt. Chris Mckeand, Vicki Ley, director of Addiction Services of the Bowen Center and Kim Kelley of Serenity House. Questions were asked concerning where residents can take unused prescriptions. The officers informed the public the Justice Building in Warsaw has a collection box in the parking lot by the police parking for prescriptions. The box is an old, black mailbox with instructions on it as to what can be dropped off. The program was hosted by Mickey Ashpole, a Kosciusko County native and recovering addict, and moderated by Denny Wilson of Warsaw Community Church.